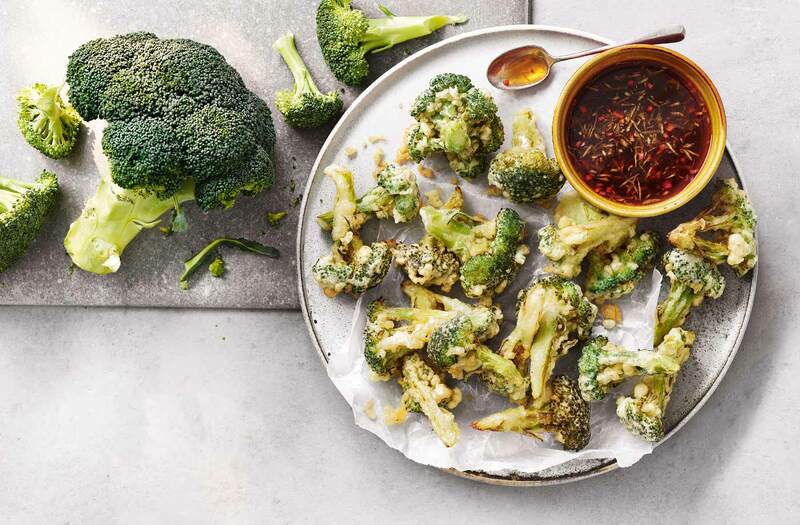 Try something different with this Japanese-inspired tempura broccoli recipe. Sparkling water is the secret ingredient to a super crisp batter and the tangy dipping sauce makes this a great vegetarian starter for sharing. Mix together the dipping sauce ingredients in a small bowl. Set aside. Sieve the flours and salt into a large mixing bowl and add the beaten egg. Make a deep well in the centre and whisk in the sparkling water, a little at a time, to create a smooth batter. Set aside. Blanch the broccoli in a large pan of simmering water for 2-3 mins. Drain well, then allow to cool slightly in the colander. Pour enough oil into a large saucepan so that it comes a third of the way up the sides. Place over a high heat until it reaches 190°C. If you don’t have a kitchen thermometer, drop a small cube of bread into the oil – if it turns golden brown after 30 secs, the oil is hot enough. Working in batches, dip each broccoli floret in the batter, allowing the excess to drip off, then carefully lower into the oil with a slotted spoon. Fry for 2 mins or until crispy and an even golden colour. Transfer to a plate lined with kitchen paper. Repeat with the remaining florets. 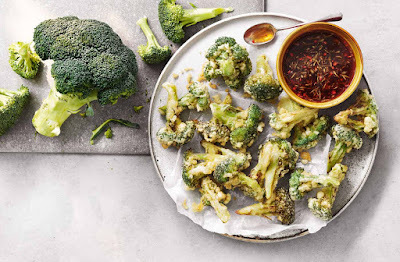 Spread the tempura broccoli on a large plate, sprinkle with a little sea salt and serve with the dipping sauce.